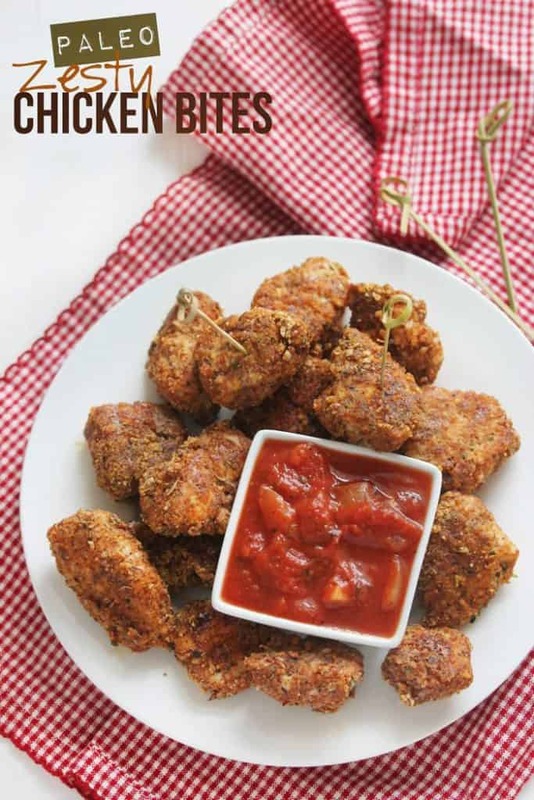 These Zesty Chicken Bites are the perfect healthier version of your favorite chicken nuggets! They are low carb, flavorful, and completely gluten-free and grain-free. A reader favorite and loved by adults and kids alike! While snowed in last week, I was craving an appetizer-like snack that I could make with the organic chicken breasts I had in the fridge. I realized that it’s been a while since I’ve had chicken cutlets. My beautiful mom makes killer chicken cutlets. She made them often growing up and then passed the recipe along to me years ago. You can bet those days were filled with some delicious chicken parm. Since those breadcrumbs are no longer in my diet, my task was set! Instead of the whole chicken cutlet thing, I went with bites (or nuggets), call it what you’d like. The perfect appetizer when entertaining or just for your typical Football Sunday get together! 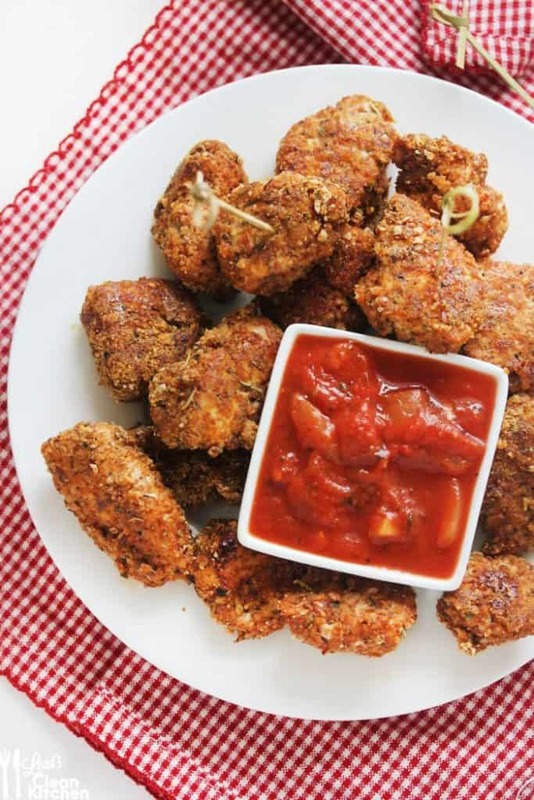 These Zesty Chicken Bites are perfectly crispy. Your friends won’t even know they are healthy and gluten-free! Read through the comments below to see how others have made this recipe their own! In a bowl, combine almond meal/flour and all spices. In a separate bowl crack 1 egg and add 1/4 tsp water, whisk together well. Dredge the chicken pieces into the egg and toss until fully covered. Transfer chicken pieces to the spice mixture and coat evenly. Place on baking sheet; repeat until all are coated. Bake for 12-15 minutes then flip chicken bites over and cook for another 10-12 minutes until golden and crispy. *Depending on how many chicken pieces you use, you may need to increase the flour/spice mixture. *Serving size will depends on how small or large you make the bites. Mine make about 20-25 chicken bites. *Leave out parmesan cheese for fully dairy-free. Yummy! Those look wonderful! And they appear to be gluten free….which I am beginning as of tomorrow! Need to keep my protein intake up for my training, so these would be great! Yum! Thanks for sharing 🙂 Will be needing you a lot over the next few weeks I think! i’m snowed in and trying these today! Thanks love! These look unreal!!!! I need them in my life. I’ve only made this recipe with almond meal so I can’t vouch, but using any breadcrumbs you’d like should work great! Okay thanks! I think I might give flax meal a try..
Flax is a great idea! Yum! I think my only problem would be not eating the whole batch myself! Olivia- I just made them with cashew meal and they turned out awesome! 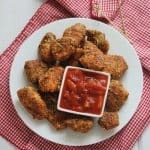 Just made these and it’s literally the best chicken I’ve eve eaten. This recipe will definitely stay in rotation!! These look delicious! I will definitely be bringing them to my next friend gathering! The snacks are usually good but not a ton of super healthy options! Great recipe! I made these last night and it was a HIT! We dipped them in Frank’s Red Hot for added spicy but the bottom line, they were delicious! As I said on my instagram, Guuuurl you know what you’re doing in the kitchen!! I will definitely be making these again and I’ve already passed the link onto two of my friends 🙂 Thank you! These look amazing. One little problem: my little fuel is allergic to eggs (bummer she’s missing out on their amazing nutritional powerhouses and TASTE!). Any suggestions for replacing? Not sure how a flax egg would work here… Thanks!!! Hi Ellie!! Aw! Honestly, I haven’t tried a flax egg, but it couldn’t hurt. Also, if your chicken is pretty sticky, I bet you can get by without the egg (or by using a little oil). I made this using olive oil instead of an egg. It turned out really well! I also used the flax instead of almond. I will definitely make this again! What a wonderful idea – did the almond meal crisp up in the oven? These were delicious! 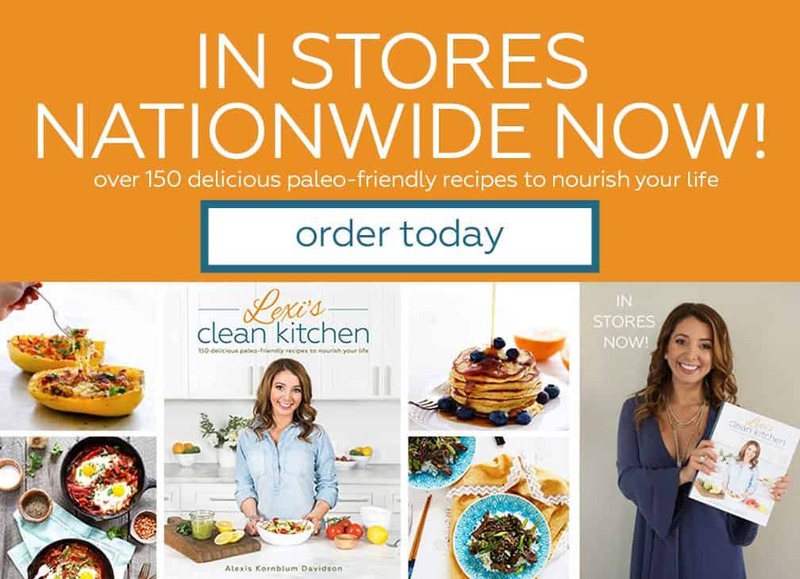 I visit many blogs for Paleo recipes and this is the first time I felt the need to leave a comment! I didn’t have the 1 tsp Italian Seasoning.. so I substituted with 1/2 tsp Basil and 1/2 tsp Oregano. I will definitely use this recipe again. Great job! Almond meal is almonds ground with the skin on, and almond flour is ground almonds that are skin-less. These were excellent! Thank you, Lexi! 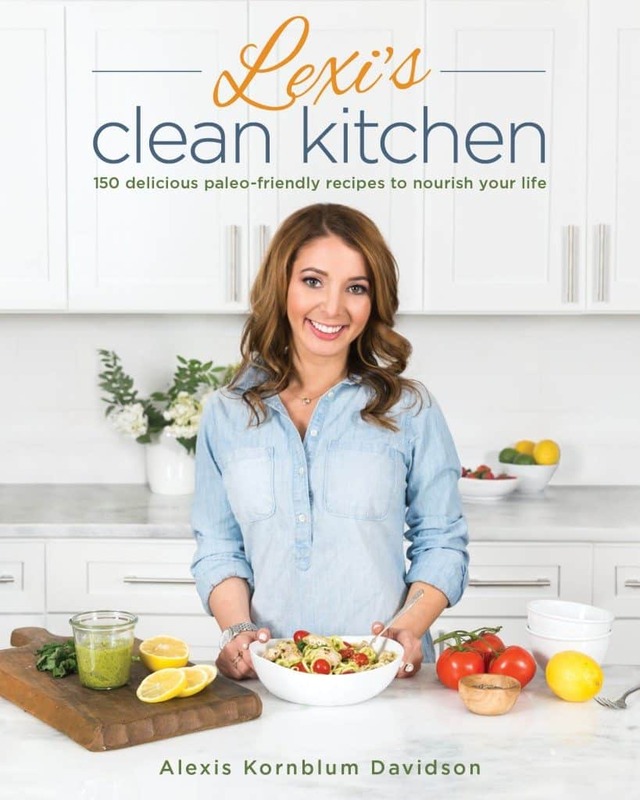 Do you have a good paleo marinara recipe you’d recommend? Whoa, these look beyond amazing. I can’t believe they are clean! I am loving these. So happening soon! I found almond meal/flour in the baking specialty section of Shop Rite. I doubled the recipe and found I needed more than double the spice and almond flour mix. But this is really delicious, and I’m sure you could customize it with whatever spices you like. Next time I am planning to try coconut flour because my son is both celiac and allergic to nuts. Thank you Lexi! Made these yesterday…. were good, but struggled with chicken being over cooked and dry. Second batch I reduced, but still somewhat dry. Today I made the same “breading” but added 2 tsp brown sugar. I breaded pork chop cutlets. They were out of this world! Sooooo Good! Made this Wednesday night for dinner using flax seed meal (couldn’t find almond meal at the supermarket) and the husband ate it like it was gold. We don’t even keep a paleo diet and he couldn’t get enough of them! Super easy to put together and bake- a definite add to the week night dinner routine. Thanks! Made these tonight they are the bomb.com I see above people were asking about the egg. I didn’t have one on hand but if you lightly coat the chicken with olive oil that works too, I read it online somewhere and it worked for me just fine. For my dipping sauce I mixed plain greek yogurt with siracha. Sauce is so good it tastes like a cheat! Not sure if greek yogurt is paleo friedly, but worked for me. Thanks Lexi for this recipe, definitely making it for Super Bowl Sunday! These look absolutely delicious….and healthy, too! Thanks so much for sharing at Saturday Night Fever – can’t wait to try!! Hi there! Have you ever frozen these to use later? I have twin seven year olds, and these would be awesome to have on hand in the freezer. Would you freeze them after cooking or before? I’m thinking before. These were delicious!! I left out the cayenne pepper and red pepper flakes for my pre-schooler, but we didn’t miss the heat at all. This is a great recipe that I will definitely be making again soon!! That’s so great! Happy they liked! 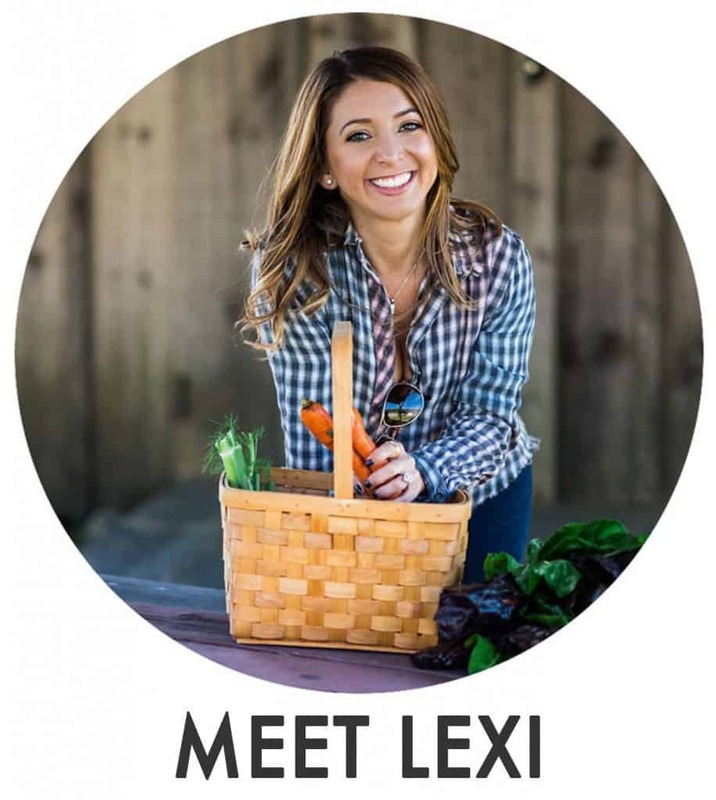 Amazing recipe, Lexi. Thank you for being ORIGINAL. Oh my goodness! I need to make this…and dip it with organic ketchup! 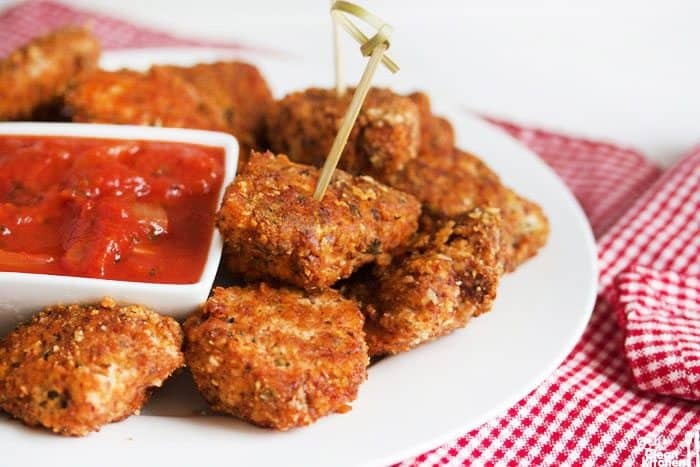 Loved this recipe….my nuggets were moist and flavorful. Is Flaxeed meal worth buying JUST for this recipe? Any other ideas or things you can do with it? Thanks! You can do soooo much with it. I love it! These look so delish! Any idea if they would be good cold the next day or do they really need to be enjoyed fresh? Thanks in advance! I personally love them cold the next day. Awesome! Can’t wait to try these – thanks for the super quick response! Hi! Someone in my Facebook group shared this site with us so I came to take a look. I’m definitely loving the information. I’m bookmarking and will be tweeting this to my followers! Wonderful blog and great style and design. I made this tonight. However, I used chicken breast and cut it into cutlets instead of pieces. My man LOVES chicken parm and he went nuts over this recipe!! I made doluble the dry mix so I would have enough to coat. Right before the cutlets were done in oven, I added motz cheese to his cutlets. I finished the dish with some marinara sauce. I’m not kidding…..he devoured it! Very very good! This is going to be a regular dish in my house! Do you have a suggestion as to how to get these extra crispy without making them dry inside?? Thanks! We’re yours dry? Mine are generally crispy but juicy! Would pork rind dust work for these in place of almond meal? I can’t guarantee since I haven’t tried it with anything but what’s listed in the ingredients there. Let us know if you adapt it and how it works out! I made them with pork rind dust in place of almond flour (meal) and they were excellent! What is a good egg substitute for this recipe? What about for baking? These were DELICIOUS!!! The spice mix was perfect, definitely zesty. The chicken stayed so moist too! I ate these with homemade honey mustard sauce made with Greek yogurt 🙂 thanks so much for sharing! I made these with chicken thighs instead of breasts and with flaxseed meal instead of almond meal. Delicious! I did increase the amount of all of the spices (save the cayenne) by a factor of 3, and used sweet Hungarian paprika and mild California chili powder. Thanks for the recipe! Dinner tonight was a resounding success (and I had enough breading left over to prep some of my lunch chicken with the breading as well, double score). Made these for dinner last night and they were awesome! Absolutely perfect dipped in some Paleo homemade ranch 🙂 They were good leftover for lunch today too, even heated in the microwave! I did double the recipe and had to make 2 1/2 times the coating mixture like an earlier person said. Question– does anyone know nutrition info/ how to calculate it for this recipe? These look awesome. I live alone…do leftovers reheat well? In all honesty these are still baking so I haven’t tasted them yet, BUT I found that there was not nearly enough almond meal/spice coating for a pound of chicken. I only got through about half a pound before completely running out. And even though I greased my tin foil, half of the spice mix still stuck to it, pulling off the chicken as I turned them. I’m glad I read the comments saying that cooking for the length of time you recommended makes them dry so I can pull them out a bit early. Hoping the taste is worth these little obstacles! I am in love with these! We just made these (tripled the recipe for my size family), and they are so incredible. We followed the recipe exactly (-minus the chili flakes), and it turned out SO GOOD. None of my family is on whole 30 except me, and every single chicken piece was GONE. This will stay in our rotation for sure! Thanks so much for the recipe!!! I’ve tried these 3 times and they have great flavor, however, I cannot get the breading crispy at all. The breading is moist and very light in color. What am I doing wrong? If you can’t get them crispy, you probably need to space them out more. If they are too close together the steam will keep them mushy. The zesty chicken bites are aaaahmazing. Can you share the recipe for the dipping sauce you have pictured? Have you ever tried this recipe using fish? Thanks. No, coconut flour is not a 1:1 sub, it’s totally different and requires a lot more liquid! I’ve made these a few times now, they are really good. However no matter what I coat the foil with the almond “breading” sticks to the pan and not to the chicken. Any tips? Hi Lexi, Someone asked a while ago about freezing these for later, but there was no response… Do you have any suggestions for making these ahead, freezing, and re-heating? Thanks! When you re-heat, what temp & how long? Sorry, I don’t do a lot of make-ahead stuff so I am kind of a newbie! Thank you! I’ve made this about 20 times now and it’s so delicious!… it’s a perfect go to for weeknight dinners! Very good; I used a bit more of the spices. Strips were pretty small; so baked them about 10-12 min. They were not crispy, but were good, nicely tender and juicy. I may try sauteing next time. Simple and quick. I might also try the paleo panko-style crumbs I bought at Natural Grocers to replace almond flour. Thank you for the recipe. I’ve been making these since 2015 and love them every time! They’re really good as strips on salads for lunch (yep, delicious cold, too). Also love them with TJ’s tomato sauce (no sugar), some crispy potatoes, and roasted veggies for dinner. Add these to your list of staples!